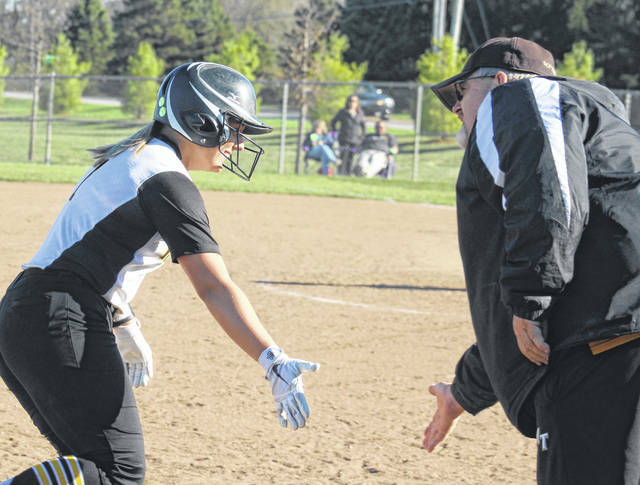 Ashley Campbell, left, receives congratulations from head coach Joe Henry after hitting her second home run of the game in the fourth inning against East Clinton Tuesday, April 9, 2019. Campbell now has six home runs on the season. The Miami Trace Lady Panthers belted a season-high five home runs against East Clinton Tuesday, defeating the former SCOL opponent Astros, 14-4 in six innings. Olivia Wolffe hit her second of the year, Jessica Camp hit one (her fifth), Ashley Campbell had two home runs (giving her six) and Sidney Payton hit the first of her career. Wolffe struck out a season-high 17 and did not walk a batter in six innings for the win. East Clinton did collect seven hits. K. Brightman started and took the loss for the Astros. She pitched three innings and started in the fourth, but did not retire a batter in that frame. She allowed five hits and six runs with three walks and one strikeout. M. Campbell pitched 2.2 innings with eight hits and eight runs, two walks and two strikeouts. Miami Trace scored three runs in the first and three in the second. East Clinton got on the board with three runs in the top of the third. Miami Trace hit three home runs in the fourth inning, scoring five times to take an 11-3 lead. The Lady Panthers scored one run in the fifth, answered by one from East Clinton in the top of the sixth. Leading 12-4, Miami Trace needed, and got, two runs in the bottom of the sixth to invoke the 10-run rule. The first two batters were retired in the sixth for Miami Trace. Kylee Rossiter walked and Kaylee Hauck hit her second triple of the game to make it 13-4. Wolffe walked and Camp reached on an error to score Hauck. Miami Trace (8-0 overall, 3-0 FAC) has a big game coming up Wednesday at home against defending FAC champions Jackson at 5 p.m.
Offensively for Miami Trace: Kaylee Hauck, 2-5, 2 runs, 2 rbi 2 3b; Olivia Wolffe, 1-5, home run, roe, 1 rbi, 1 run, 1 bb; Jessica Camp, 2-5, home run, 2 rbi, 1 bb, roe; Piper Grooms, 0-0, 2 runs; Ashley Campbell, 2-4, 2 home runs, 2 runs, 4 rbi; Sidney Payton, 3-4, home run, 1 2b, 2 rbi, 2 runs; Krissy Ison, 1-4, 1 bb, roe, 1 rbi, 1 run; Cassidy Lovett, 0-3, 1 rbi; Breanna Eick, 0-1; Maddie Mossbarger, 1-3, 1 bb, 1 run; Devin Thomas, 0-0; Aubrey Schwartz, 0-1; Kylee Rossiter, 1-4, 1 bb, 1 run.